Venus Transit, June 5/6, 2012. A Venus Transit takes place when Venus is directly between the Earth and the Sun. 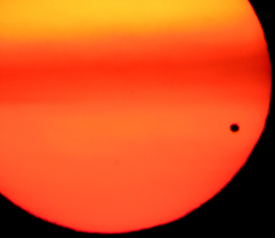 This is a rare occurrence, the last Venus Transit was in 2004, the next transit will be in June 2012. If you miss the transit of 2012, the next transit will be in the year 2117. The 2012 Transit will not be visible in Western Africa, Western Spain, Portugal, most of South America, most of the Atlantic Ocean and Antarctica. The rest of the planet can see part or all of the Transit (assuming there are no clouds). Looking at the sun is potentially dangerous, so you must use proper eye protection (however when the sun is red during sunrise or sunset eye protection is unnecessary). The event has past, but see photographs of the June 2012 Transit. There are several events where the public can view the Venus Transit in the Ann Arbor area. All events held on June 5, 2012. Kensington Metropark (near Brighton Michigan). (5:00PM to 12:00 midnight). From 6 pm to sunset you can view this once in a life time celestial event through the solar filtered telescopes and binoculars provided and guided by the members of the Great Lakes Association of Astronomy Clubs. Night sky viewing will continue after sunset. Program is free—Vehicle entry permit required. This event is hosted by Kensington Metropark and the Great Lakes Association of Astronomy Clubs (GLAAC). More information can be found at The Transit of Venus (Kensington Metropark). Angell Hall (University of Michigan Central Campus, Ann Arbor Michigan). (5:30PM) This event is hosted by the University of Michigan Astronomy Department. Join us in Angell Hall Auditorium B after 5:30 PM to watch the live webcast from Hawaii. Weather permitting, we’ll also be on the roof of Angell Hall. More information can be found at Michigan Astronomy Special Events. (For the location, see map below). Ashley Street (Ann Arbor Michigan). (5:30PM) May be cancelled if it’s cloudy. This event is hosted by the University Lowbrow Astronomers. It will take place on Ashley Street on the sidewalk between Huron and Washington next to the City surface parking lot (see map below). Ann Arbor District Library, Traverwood Branch, Program Room (Ann Arbor Michigan). (4:30PM to 9:00PM). Transit of Venus Lecture and Public Skygazing, The University Lowbrow Astronomers will talk about the history and science of the Transit, as well as how to protect your eyes and equipment while viewing the phenomenon. If it’s clear, following the Library talk, participants will be encouraged to visit nearby Leslie Park to see the Transit Live. Viewing will begin at 6:04PM until sunset and amateur astronomers will be available at the Park to offer magnified views of the event through telescopes fitted with proper solar lenses. Program participants will receive safe solar glasses to view the event. If the Sun is not visible due to clouds or inclement weather, the Library will project a live internet feed of the Transit at the Traverwood Branch. Eastern Michigan University (Ypsilanti Michigan). (6PM). Transit of Venus at Sherzer Observatory, hosted by the Astronomy Club at Eastern Michigan University. Other events can be found at the The Transit of Venus (Kensington Metropark) page. The map below shows the Ashley and Angell Hall Observing Locations. For the Ashley Street Observing Location: the surface parking lot is marked “P” and the observing location is marked “Telescopes.” Note there is an alternate parking lot two blocks to the north (also marked “P”). The map below shows several locations including the Detroit Observatory and Angell Hall. The last Venus Transit was visible from Southeast Michigan on the morning of June 8, 2004. There were several venues in the Ann Arbor area where this transit could be viewed. See Photographs of the June 2004 Transit. The photograph at the top of this page was taken during the 2004 Transit by Brian Ottum.